The IMAX system has its' roots in Montreal's EXPO 1967, where multi-screen films were the hit of the fair. A small group of Canadian film makers/ entrepreneurs, (Graeme Ferguson, Roman Kroiter and Robert Kerr), who had made some of those popular films, decided to design a new system using a single, powerful projector, rather than the cumbersome multiple projector systems used at that time. 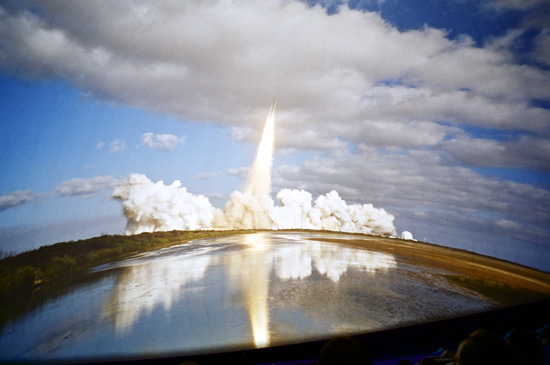 The result: The IMAX motion picture projection system which would revolutionize giant screen cinema. IMAX premiered at the Fuji Pavilion at EXPO 1970 in Osaka, Japan. The first permanent IMAX projection system was installed at Ontario Place Cinesphere in Toronto in 1971. Dome screen Omnimax, its' sister system, debuted at the Ruben H. Fleet Space Theatre in San Diego on March 10, 1973. A few years ago the trade name Omnimax was changed to IMAX Dome. The IMAX image 70mm/15 Perf. is ten times larger than a conventional 35mm/4 perf. frame and three times larger than a standard 70mm/5 perf. frame. The Rolling Loop projector at the Tycho Brahe Planetarium & IMAX Dome theatre, Copenhagen. IMAX and IMAX Dome projectors are the most advanced, highest precision and most powerful projectors ever built. 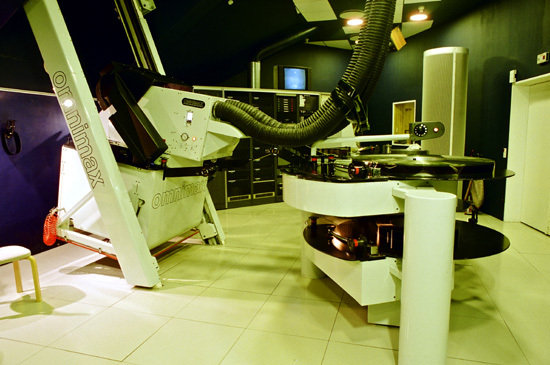 The key to their superior performance and reliability is the unique Rolling Loop film movement system, used in no other projector. The Rolling Loop was invented by Ron Jones from Australia. The film run horizontally 24 frames per sec. in a smooth, wave-like motion. 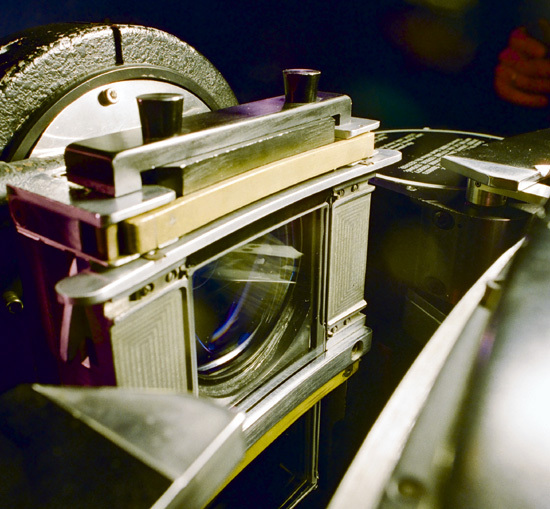 During projection, each frame is positioned on fixed registration pins, and the film is held firmly against the rear element of the lens by a vacuum. As a result, the picture and focus steadiness is far above normal standard. The projector mechanism has six mechanical components which must act in precise synchronism to advance the film, frame by frame, with high accuracy and negligible wear and tear. These elements make up what is called the Rolling Loop Film Transport System. Rotor (1) and front section of projector. 1: Rotor. A 37,5 inch diameter drum containing eight windows or gaps, each of which forms a loop or wave in the film as it passes the input sprocket, and then advances the film by carrying the loops past the aperture. Input Sprocket (2) and Rotary Air Valve (6). 2: Input Sprocket. A sprocket is driven in synchronism with the rotor to feed one frame of film (15 perforations) per rotor gap. 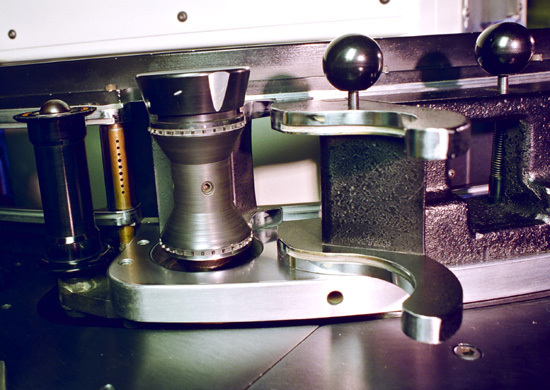 It positions the film so that the cam pins enter the intended perforation at a precisely determined point. Registration Pins (4) and Cam Unit (3). 3: Cam Unit. A mechanism which oscillates the film-engaging pins or claws (two pins at each edge of the film) to catch and slow down the film, fed by the input sprocket, and to preposition the perforations which are engaged by the registration pins at the aperture. 4: Registration Pins. Four fixed pins (one at each edge of the aperture) which engage the film perforations to precisely position the film during projection. 5: Output Sprocket. Like input sprocket, it rotates in sync with the rotor. 6: Rotary Air Valve. This valve, which has one outlet for each rotor gap, pulses air to a row of jets at the rotor gap as it passes the input sprocket in order to help shape and accelerate the loop of film which forms in the gap at that point. The images are moved every time the rotor gap passes the aperture block with a "wave" of one frame (15 perforations). The images are then fixed by the four pins on the aperture block, helped by the vacuum on the lens, in order to keep the pictures in focus. Between every rotor gap a shutter is placed so the pictures are shown twice. This 68 per cent shutter transmits one third more light then does the 50 per cent shutter in conventional projectors. The IMAX projector is equipped with a 15.000 watt water cooled Xenon lamp. In smaller theatres a 4.000 watt lamp is enough. 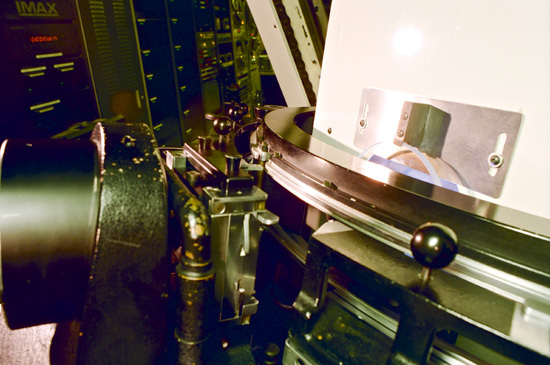 The IMAX Dome projector is the same type projector as an IMAX; the lens design is different, however. 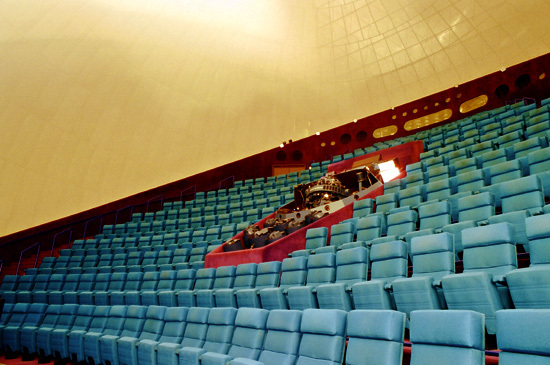 IMAX Dome was developed for use in tilted planetarium- type domes. The projector and lens are located slightly behind and above the center of the dome (the planetarium's star projector is placed in the geometric center of the dome). IMAX Dome produces a picture extending 180 degrees horizontally, about 100 degrees above the horizon and 22 degrees below. Our dome in Copenhagen is 23 meters (76 feet) in diameter. The dome surface area is 1000 square meters; 800 square meters are used for IMAX Dome projection. The screen is made of many small plates of aluminum with 20% of the area perforated with holes. You can see through the screen if the backstage area is lit up. The maximum size of an IMAX screen is 26 x 35 meters (87' x 17') and 27 meters in diameter for an IMAX Dome screen. 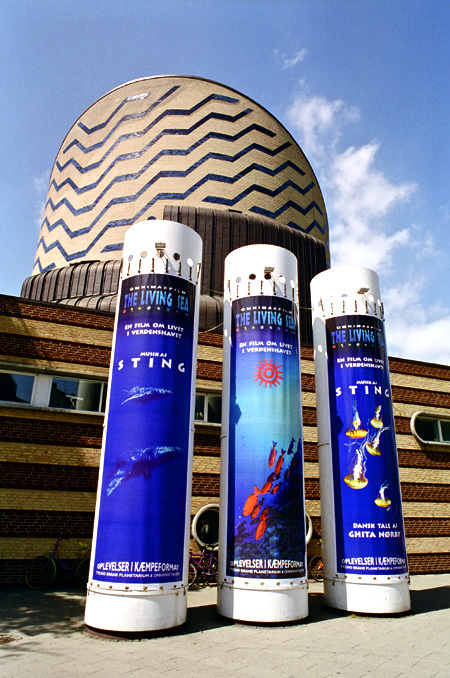 A total of 144 IMAX/IMAX Dome theatres are currently operating world wide [By 1996/97]. There are more than 110 IMAX films. 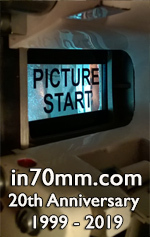 If you have any IMAX related questions please do not hesitate to ask Rene Sørensen directly through E-mail or through ..in 70mm - The 70mm Newsletter. Sources: IMAX Fact Sheet and J. Creighton Douglas "What is IMAX . and why".